My work focuses on the correlation of atmospheric moisture and the changing light of day within a landscape. 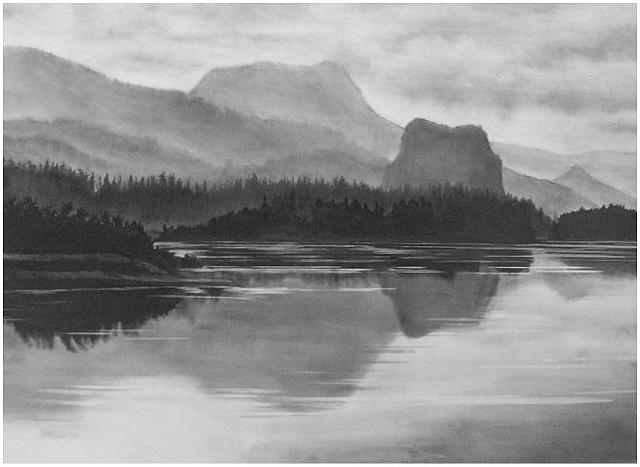 I incorporate the reflections of diffused sunlight from the surrounding environment into my grey scale drawings. This environmental effect bestows my work with the drama created by extreme light, in a world frozen in time. My intent is to bring the viewer into my landscapes creating a sense of Daoism, allowing them to become one with nature. The viewer is placed into the landscape in a moment of complete silence and solitude, while finding peace with the unknown elements which are eluding the scene or are cast into the shadows. Each piece incorporates graphite and fumage, selected for their carbon composition and diversity of values. Fumage is a technique created by utilizing a torch and the emancipated motion of a flame. The freedom of the flame creates the mystic within each individual image.